This site is dedicated to working towards developing a thriving minerals industry for Ireland, both North and South. 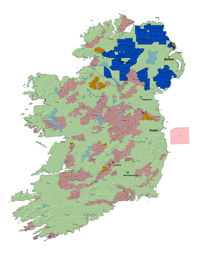 Mineral exploration and mining throughout the island of Ireland is carried out by the private sector, with the support of the regulatory authorities in both Ireland and Northern Ireland. Neither jurisdiction is directly involved in either exploration or mining activities. The island has a varied geology and a proven mineral endowment that has resulted in a vibrant mining sector, with active mines of base metals, gold, and industrial minerals such as gypsum and salt. Both governments actively encourage exploration and mining, and facilitate the development of mineral resources consistent with high environmental standards. While there are many areas of common practice in relation to exploration and mining, differences exist between the two regulatory regimes. However, in a practical demonstration of North-South co-operation, both jurisdictions are working towards developing a thriving minerals industry based on mutual cooperation and alignment for the whole of the island. We encourage you to visit our individual websites, where you will find further information. We hope to see you in Ireland soon!